Before full-fledged summer activities kicked off, Megan Schossow met with Dr. DeAnn Lazovich, Associate Professor and Researcher at University of Minnesota School of Public Health. This meeting marked the kick off a summer sun safety campaign for UMASH. After consulting Lazovich’s expertise in skin cancer while developing a Sun Safety Checklist and handout, UMASH was connected to agricultural journalist Jonathan Eisenthal. Eisenthal , a free-lance ag-writer based in Saint Paul, wrote an article, “Use multiphase approach for protection from sun” that draws on Lazovich’s recommendations and a personal story from an agronomist and cancer survivor. The article appeared online in “The Farmer” and in print in August 2018. 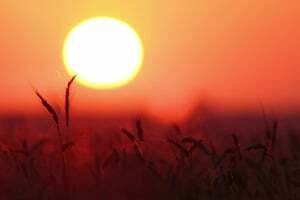 With many farmers and agricultural employees working long hours in direct sunlight, sun-related skin illness is a serious concern. The Sun Safety Checklist, sunscreen samples, and fast-fact half-sheets were used to hammer home important messages on sun-safety best practices. The collaboration between University of Minnesota, media, and UMASH has been a great opportunity to reach those working in agriculture and share important messages.